I wonder if I am missing something simple but is there a way to solo a track during playback? I can't seem to find any information on this apart from some discussion relating to FCB1010s. Do you have a Midi interface? If so, which one? I own a FCB1010 but have never used it with my iPad. I am just wondering if you can solo a track during playback without the use of an interface? I thought this might have been a feature that I missed. I would have found it very useful for when recording a session once all the banks were full/ready. Cant find the theme anywhere else so im posting here. Is there a possibility in Loopy that when you start next prerecorded track, previous track would mute ? @denias - binding "Mute and play next muted track" may be what you are looking for. set one pad of your softstep to cc (80..or another cc-number) latch type (that means: step 1=off, step2=on). set binding in loopy to ´toggle mute´ ´track 1´ (cc80, on, ch1...or another channel). next binding for track 2: step again the same pad on softstep and send to loopy the next binding: ´cc80, off, ch1´ ´track 2´. 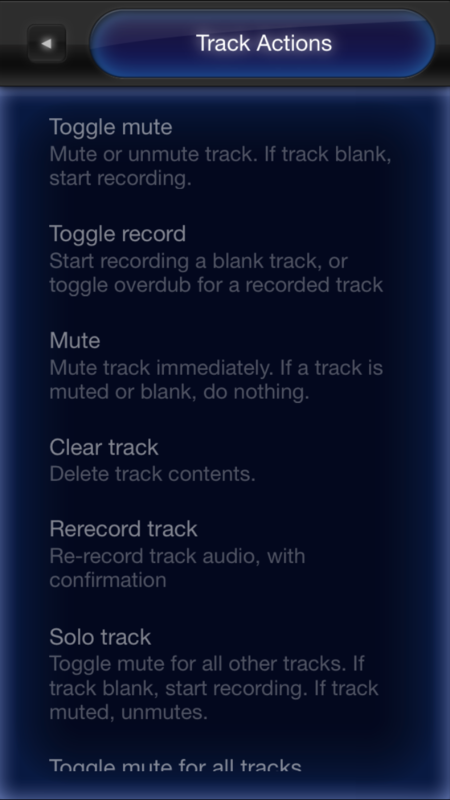 with the first step you will mute or unmute track one. with the next step mute or unmute track 2. I posted the same question...it would be very cool to have a simple solo track button for each track. Must be a major problem to achieve though, as to my knowledge no other ios looper has this feature. @jazubon Loopy HD has a solo track midi function. I use it all the time. Go to " Track Actions" and select "Solo Track." thanks for that....I don't use a midi controller.....but maybe now I'll have to get one.